Firefighters don’t get to choose weather conditions. When the alarm goes off they are on their way to a fire or other emergency, and more often than not, the call is usually during adverse weather conditions. But on February 22nd to 25th four brave members of the City of Leduc Fire Services have chosen to camp out on the rooftop of Leduc Fire Station #1 regardless of temperature or weather conditions. 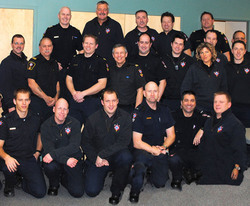 The Leduc firefighters are volunteering their time and challenging exposure to the elements by participating in the regional firefighters’ rooftop campout February 22-25, 2011. This is a highly publicized large scale charity event raising awareness and funds for Muscular Dystrophy. Other firefighter stations participating in the regional campaign include Edmonton, Strathcona, St.Albert and Spruce Grove. The aggressive fundraising goal for Leduc is to raise $25,000 and the regional goal is hoping to exceed $100,000. Karen Faryna FF/EMRPublic Relations Coordinator City of Leduc Fire Services proudly explains. “This event we are partnered in has so much to be excited about. Not only does this bring our brothers and sisters together by commitment, compassion, honour and tradition with a common goal from across our region, it brings out the best in us all when we put community before self to bring positive change to better the lives of those who are less fortunate. Isn’t that what it’s all about?” Muscular Dystrophy Canada helps children and adults who are affected by any of the more than 100 neuromuscular diseases covered by MD’s comprehensive medical services and research programs. The citizens of Leduc can be thankful knowing they have the daily protection provided by the Leduc Fire Services in the event of a fire or other emergency. They can be grateful when they see how the firefighters are so willing to go a step further and volunteer time and effort to a fundraising and awareness campaign for Muscular Dystrophy. You can help. Tuesday, February 1st, firefighters will be at Sobeys holding their first Boot Drive. Between the hours of 3 pm to 7 pm on 10% Tuesday, the Leduc Firefighters will be volunteering to bag groceries for Sobeys’ customers. In addition to donations put into the boots of the firefighters boot by customers, Sobeys is also ‘kicking in’ to the firefighters boots by paying the firefighters $10 an hour which will be designated to the campaign. Thursday, February 17th, the Leduc Firefighters will be hosting a Gala at the Denham Inn from 7-10 pm. This event will officially launch the "Fire on the Roof" campaign. Tickets for the dinner and silent auction are selling for $50 per person. You can purchase these at the Fire Hall, email kfaryna@leduc.ca or call her at 780.953.0488. There are many ways to support the event, a gift-in-kind such as supplies, a monetary donation or a combination of both. Donations can be made at the Fire Hall, online at www.muscle.ca/campout via Leduc Campout link and during the Boot Drives throughout the month of February at various locations in Leduc. For more information or to assist, contact kfaryna@leduc.ca or call her at 780.953.0488.